The best of Cornelia Thomsen’s “Stripes” series — the stronger half of “Stripes and Structures,” her debut show at Leslie Feely, open through October 25 — deliver a similarly dizzying punch up close. In these works, myriad vertical bands of blue and gold hues overlap across the canvas. Some stripes have crisp edges, while others are blurred; the fuzzy lines suggest roundness, causing the eye to jump. The artist began the series by attempting to paint beachy horizons, and retains the sand-and-surf palette and horizontal strokes. (She rotates her paintings 90 degrees when finished.) Her choice of relatively small canvases and a diptych format, however, leave all but the largest works with the hopeless appearance of upholstery when viewed more than a few feet back. Thomsen, born in 1970 in the former East Germany, trained first as a ceramics painter and is known for her precision. “Structures,” a series of ink-on-paper works composed of many fastidiously executed hatch marks, exemplifies a different, more personal control. Hung close together, Structures No. 11, 15, and 12, all 2011, create a striking group. Each work exhibits a different kind of mark making, from tiny dots to longer dashes. 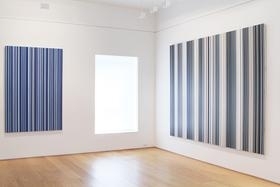 The resulting 12-by-12-inch compositions read as overall gray fields in three subtly different saturations, testifying to Thomsen’s steady hand and perceptual acuity. A version of this article appears in the January 2015 issue of Modern Painters magazine.